Anytime you have a Gingerbread Man cookie in hand, you will find your family pet is not far away. They can tell they are missing out on something since everyone smiles when eating their cookies, and the Gingerbread aroma is hard to miss. 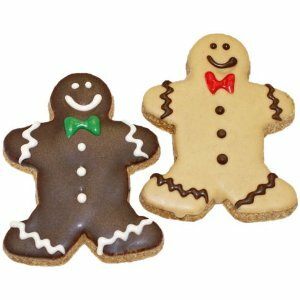 Our dogs will now be able to join in on the fun with Pawsitively Gourmet Classic Gingerbread Man Cookies for Dogs . Available a convenient 32 ounce package. The treats look just like the ‘human’ version of a Gingerbread Man cookie, but made for your dog as a healthy treat. Well, healthier than sharing your frosted cookie. Looking at them though, it’s hard to tell the difference between your cookie and your dog’s version.